It’s inspiring to meet newly minted public relations or communications grads looking to crack that first job in their chosen field. 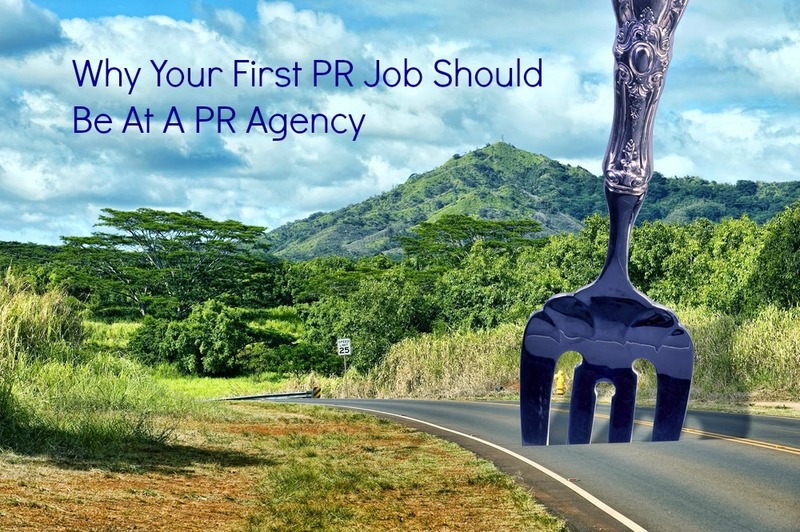 And though the first break is rarely easy, for anyone set on a career in PR there are likely to be forks in the road at the beginning of the career journey. I often speak to new graduates who ask advice about how to start their career. They might be looking to join a large international company as the newest corporate communications hire, or want to break into PR at a nonprofit group. Here in New York, some set their sights on a media or fashion brand to learn those businesses while also gaining experience in external communications. You’ll learn the business of public relations. PR is PR no matter where you are, right? Not necessarily. On the corporate side, staff learn public relations as it serves the organization, but at an agency, it’s the core business. Usually it’s the only business. That translates into a deeper commitment to training and greater mastery of the PR discipline and a far greater breadth of experience through working for different clients. The agency environment helps those new to the workforce find out what they like, where they excel, and what the range of opportunities truly is. And you’ll benefit from layers of experiences professionals who can teach you. Agencies offer a path to promotion. A successful agency offers extraordinary upward mobility for anyone with the right skills and a drive to succeed. Will you reach a ceiling at some point in an agency? Almost certainly, yes. But for a professional with good skills and less than a decade of experience, almost any road at a thriving agency will lead to advancement. This comes in contrast to the corporate communications world, where you’re typically dealing with a narrower path to growth. You’ll learn what you love. Juggling multiple clients in different industries or sectors may not be for everyone. But the chance to participate in account management for clients within different industries, from B2B technology to food and beverage PR, will help anyone figure out where their passion lies and help focus career plans for the future. This is a great benefit even if you don’t plan on an agency career. Or not, in which case your agency experience will be short. This is the good news-bad news side of life at a PR agency. Like nearly any creative services business, a PR firm earns its keep nearly every day. The agency has to deliver against its plan quickly and well. Those exigencies force you to learn how to be productive and efficient, or they force you to look for a different environment for your particular skills. For the most part, agency life is about selling. And while it varies with the type of firm, even junior staffers are exposed to the business development process. You may not be in the room where the presentation happens, but you’re likely to be a team member and observer at a minimum. And ongoing account management is a bit of a selling situation as well. Merchandising the agency’s value to clients is a part of the daily life at a PR firm. It’s experience that you can apply to your own contribution and career. From packaging dazzling content, to C-level boardroom presentations, this is also a skill that’s highly translatable to just about anything else you may do in life or work. Because it typically offers a wide breadth of work – though not as much depth as a long-term role on the client side – the agency life is ideal for multitaskers. If you thrive on change and challenge, you may love life at a PR agency. But even if you end up running corporate communications at a large brand, the agency experience will pay off over an entire career. Dorothy, THANK YOU for putting this out there. I’ve been telling PR students for years that I think they should ALL be required to do at least one internship in a PR agency before they can graduate–that’s how strongly I feel about it! I have a feeling, I’ll be sharing this post as recommended reading for a long time to come. ???? Thanks, Tressa! I also feel strongly about it; I doubt there are many corporate comms posts that offer the kind of breadth of a couple of years on the agency side. And we can always use new talent!